Your baby’s first year is an amazing and important time, filled with curiosity and discovery. Where your infant spends their day is just as important as what they do there. For our infants, we provide a nurturing tailored environment including individual cribs with fresh linens daily. We maintain individualized schedules to meet the needs of each child throughout the day. Our caregivers utilize activity plans that encourage and promote growth and development. we offer a variety of daily activities that expose the children to new things and help develop all 5 senses. They will experience outside time, tummy time, music, stories, art activities and much more. ​Each day you will receive a written daily report specific to your child that will contain information on his/her food intake, diaper changes, naps, mood and general daily behavior. 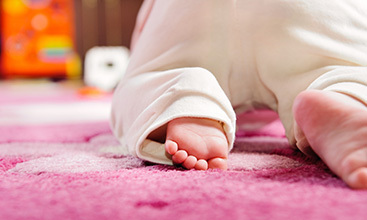 We will also make sure your baby is in line with all developmental milestones for their age. Being a toddler is a very unique experience. They are learning how to become independent and explore new things. Our toddler curriculum is geared toward your child having the freedom to experience while exploring and developing. This is their introduction to what learning is all about. We encourage the inquisitive possibilities of the adventure that they are about to partake in. For our 2’s we provide consistent daily schedules with an emphasis on social and self-help skills. Our teachers utilize planned activities each day and encourage free choice among various centers within the classroom. 2 year olds develop quickly and are eager for knowledge. They are trying to understand the world around them and how it works. Our program provides structure and guidance for children to learn how to share, get along with others and perform classroom tasks. Language and vocabulary skills are strengthened while listening to stories, singing songs and playing games. Art projects and gross motor skill activities help to develop movement and sensory skills. Children gain self confidence as they grow independently and explore the learning centers equipped with activities that support dramatic play, math, creative arts, language arts, social studies, science, blocks and books. These activities are the foundation for a lifetime love of learning. Our curriculum in this classroom is the stepping stone toward Pre-K. The approach will have your child learning while having fun. In this classroom they will learn all their “School Readiness” skills. We will teach them character building activities such as sharing, caring, compassion and self help. In this age group the children are eager to learn new things and we are prepared to go above and beyond the typical learning experience. We will focus on all the basic lessons in math, language arts, dramatic play, science, social studies, art and independent studies. We provide expansive learning environments for our four and five year olds both indoors and out. Children learn to be independent thinkers, achievers, and leaders. 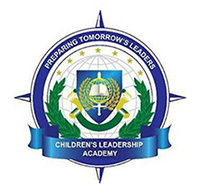 Our lesson plans are developed using a balanced and unique curriculum, which enhances character building, leadership and kindergarten readiness skills. There are many independent, as well as group activities to enjoy throughout the day. 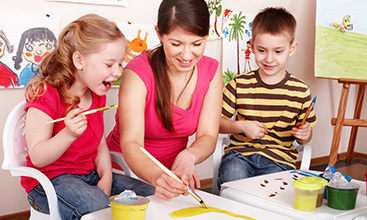 These activities allow the children to enjoy learning and to share what they have learned with others while doing so. Writing in journals, learning to tell time, and learning to tie their shoes, are just a few things they may come home bragging about. This program is full of exciting activities. We will provide homework help, tutoring and an array of learning tools. The children have full access to the computer lab and library. Your child will have time to unwind from their long day at school but still learn while having fun. They will be taught core values such as responsibility, caring, sharing, working together as a team etc. There is a wealth of knowledge in this classroom to be discovered. Each day you will receive a written daily report, specific to your child that contains information on his or her food intake, daily activities, naps and general behavior. We provide three meals daily; a nutritious morning and afternoon snack and a hot, well-balanced lunch. They enjoy two scheduled outside times daily, weather permitting. We provide each child with a rest mat and fresh linens for a two-hour daily rest time after lunch. The children are always welcome to bring their own special blanket and sleep comfort items from home. 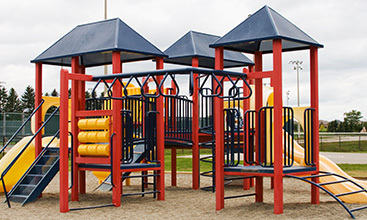 You can also observe your child’s fun and development through our state of the art web based surveillance system.